This week's Tuesdays with Dorie assignment, Caramel Crunch Bars chosen by Whitney, has left me feeling happy about the kitchen again. I've been mostly staying out and I'm feeling guilty about my semi-neglected blog (and husband) but promise to have more coming soon. And well I nearly missed the deadline for these babies, they were worth the wait. Not only were these little heath bar cookies easy to make, they didn't dirty too many dishes and came together pretty quickly. I tend to make cookies when I'm looking for a quick fix (or some baking therapy) but I like how simple and fun these were and the nice change of taste and texture. I think the recipe also leaves a lot of room for variation. Since we don't do coffee, I just omitted that with no problem at all. I'm already planning a few different versions- maybe something with peanut butter and white chocolate for my Tall Man? The next batch will also feature more milk chocolate and less bittersweet for my mom. I think it might be fun to experiment with different shapes, too. This time around, I cut some into big squares for ice cream sandwiches (which I filled with cookie dough- it was down to that or mint, so it was a pretty easy choice!) and little bite size cookies for my hubby to take to work. Don't forget to check Whitney's blog for the recipe and come back Thursday for Barefoot Bloggers and the Yoplait giveaway winners. Genius...PB & White Chocolate would be great I think! I had trouble with the ice cream sandwiches, the cookies were too crisp to bite into the sandwich. Yours look gorgeous! Mine were delicious but very crisp. I ended up using a dark chocolate on the top and they still were all gobbled up. If I had used milk chocolate I don't think they would have lasted until the next day! Your ice cream sandwiches have the perfect amount of filling (I went a little overboard) and are in a way a nice little tribute to the other Heath whose death was just another reminder to savor every moment we have. Nice post! They look wonderful, Anne. Next time, I will be using some milk chocolate for my boys. Nice job! You have the same picture of Heath that I have on my blog this week! Brilliant minds think alike. Your ice cream bars look terrific. Your cookies look wonderful, but Heath looks forever young and lovely. Thanks for posting that pic! What a nice remembrance of Heath - it is so sad that he's gone. Your ice cream sandwiches look great! These look just delicious. Nice job! Oooooh peanut butter and white chocolate. Now you are obligated to make that, just for me! Seriously. Then you have to mail me one. Your creations always have me drooling! Heath, Heath, and ice cream, all of my favorites! I am drooling over here! I have a couple of mine left - I have to put some ice cream in them! Yours look fantastic! I love a recipe that turns out great and doesn't leave you stuck with a pile full of dishes to wash! Your ice cream sandwishes look extra delicious. Can't wait to try the recipe! I loved A Knight's Tale. 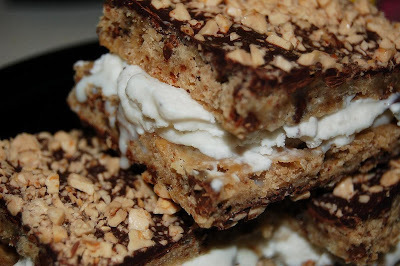 Your crunch bars look great - especially the ice cream sandwich ones! A peanut butter variations sounds wonderful! These look great! I really wish i'd had mine with ice cream. Oh Heath, I've loved him since the Patriot! So sad. I haven't seen Batman though, it looks too scary for me! Oh that looks so yummy! I was beginning to worry about you! Great bars..love the ice cream! I knew if anyone would make these the way they were shown in the book, it would be you. And I mean that in the nicest possible way! Your stuff always looks great! They look great! I love the cookie dough ice cream addition. Wow, Anne -- your bars look amazing. 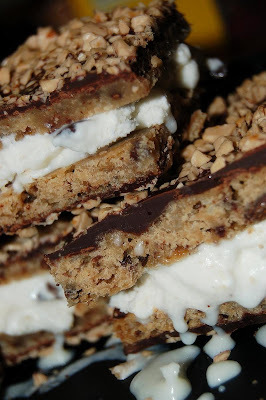 So completely perfect as ice cream sandwiches -- I will have to do that next time. I definitely miss the huge talent of the other Heath as well -- definitely a tear-jerking moment to watch his family accepting his posthumous award. Your bars look amazing. I loved them and thought they were even better with ice cream. YUM! I agree, these bars lend themselves to many variations. Yours look great wrapped around ice cream! They look so wonderful...guys here would not let me put ice cream in them...they loved them just the way they were and were afraid the ice cream would make them mushy...if you could see how fast they eat these, there is no time for anything to get mushy, but they insisted I leave them just as they are. I should show them your photo! I wish I was eating one of these right now! They look great! i was happy for such an easy week. i loved these as ice cream sandwiches. heath is one of the celebrities i actually get kind of sad about. i teared up too during the oscars. Don't you just love how easy these are to make. Yours look great. Oh your pictures with the melting ice cream are divine! Now you are making me rethink not making ice cream sandwiches with mine. I totally agree that this recipe begs to be played with --- looking forward to your experiments. Love the ice cream sandwiches! 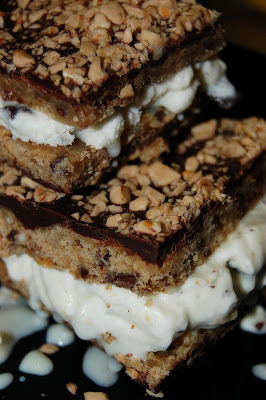 Your ice cream sandwiches look amazing! I really wish I'd tried these with ice cream. Maybe I would have liked them more. Love your ice cream sandwiches. They look delicious. PB and white chocolate amazing. I must try it. I think cutting these bars into different shapes would have been a great idea! Yeah, Heath was awesome and your bars looking crazy awesome! I love the ice cream sandwich thing! Love the photo of Heath and the Heath bars. They look wonderful! oh, honey! this is why i have avoided this blog of yours! i will want to make everything you post! i already need to stop making teats! help! anyway, love the heath comments. i will forever cherish out times being giddy while thinking about/watching him! love ya!